Enter to Win Tickets! Enter Hourly to Increase Your Odds! EVERYONE is VIP, one price, all the entertainment for everyone. Check out the event page on Facebook for more info! 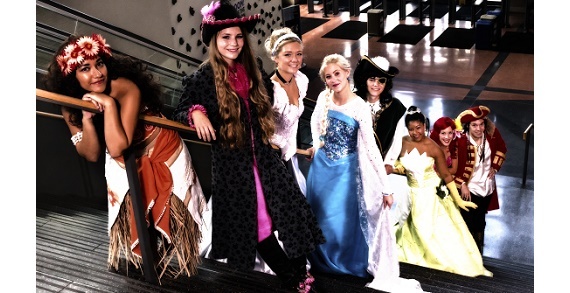 This event is directed and produced by Paulette's Princess Parties, who also produced Cinderella's Fairytale Wedding & Royal Ball here in Columbus. All LOCAL Talent comprised of amazing singers, dancers, actors and musicians. 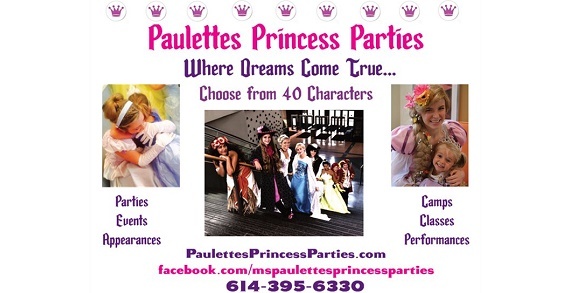 Paulette's Princess Parties has performed for both the Columbus Blue Jackets and Columbus Clippers events to name a few of many events. They are blessed to support Ronald McDonald House and Make a Wish with a portion of the event proceeds. "All you need is Faith Trust and, a Little Pixie Dust" you will be greeted by Tinker-Belle and friends who will use their Pixie Dust to transport you and your child to a "Whole New World" inside the elegant ball room at Cameron Mitchell's Exchange Banquet Center at Bridge-Park in Dublin. Pass by the "Wishing Well" and Make a Princess Wish (proceeds go to Make a Wish Coumbus). Enjoy a "theater in the round" with singing, dancing, acting and a musical extravaganza by all the princesses: Cinderella, SleepyBeauty, Tianna, Rapunzel, BeautyBelle, The Snow Queen and Snow Princess, Snowy White, The Polynesian Princess ("Moana") The Arabian Princess ("Jasmine"), Pocohontas, Mermaid of course a few surprises!!! You and your child will sing with all the princesses (all live voices, no lip syncing) and be treated to a a trumpet performance by Tianna, interactive dances with the Snow-Queen, ballet performance with the Snow-Princess. Also, learn Polynesian words and dance the "Tamu "with The Polynesian Princess, waltz with BeautyBelle and SleepyBeauty, explore the mermaid's treasure chest, have Princess Training with Cinderella and finish with a surprise musical performance with the whole cast. Your child will be up close and have interactions with all the princesses during the performance. Then there is a Grande Coronation, where each child will be personally crowned on stage and walk the "red carpet" with a princess. "Love is an Open Door" as you meet and greet with all the Princesses at their Castle Set. "Let it Go", kick off your glass slippers and dance the day away!!! Remember "Laughter is timeless. Imagination has no age. Dreams are forever." Let Paulette's Princess Parties make your child's dream come true! Call Fairy Godmother Paulette at 614-395-6330 if you have any questions. Paulette's Princess Parties can provide a lovely gift certificate, sent to your home, if you want to surprise your little princess with a gift! For the latest updates and information, be sure to check out the event page on Facebook. Hurry before the last seating is sold out! DISCLAIMER : Keep in mind that Paulette's Princess Parties is not intending to violate any copyright laws. The characters offered come from legends, folklore and fairy tales that are in the public domain. Any of the other characters who resemblance copyrighted or licensed characters is purely incidental and unintentional. All costumes used are unique and not copyrighted by any large companies. Paulette's Princess Parties is not associated with any large companies or theme parks and does not try to present as such. Paulette's Princess Parties is a private entertainment company hoping to make dreams come true for young and old. A dream is a wish...Make dreams come true with one of Paulette's 40 characters. Princesses, Fairies, Pirates, Super Star Heroes and more. From a simple meet and greet to a singing and dancing extravaganza, Paulette's characters will make you smile from ear to ear. Available for birthday parties, tuck-ins, events, camps, classes and more. 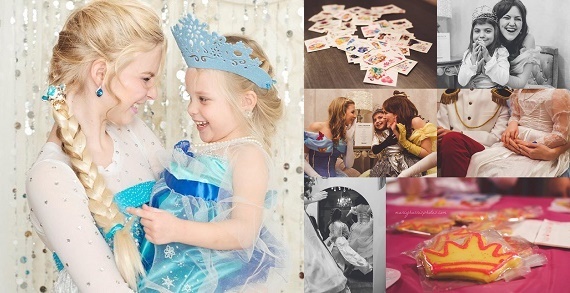 Paulette’s Princess Parties can help you plan an unforgettable experience. Paulette's talented group of actresses, actors, singers and dancers will create spectacular memories that will last a lifetime. Come to the Royal Palace Studio Extravaganza for a 2-hour Enchanted party. Fully decorated to fit your theme! $28 per child (min of 8), add a character for $50. A Royal Tuck-in or Rise-n-Shine is a special 30-minute personal experience with one of the characters. Available to join your family for breakfast or come tuck your child to bed: $95. Paulette’s Princess Parties can customize any party to your needs and dreams! 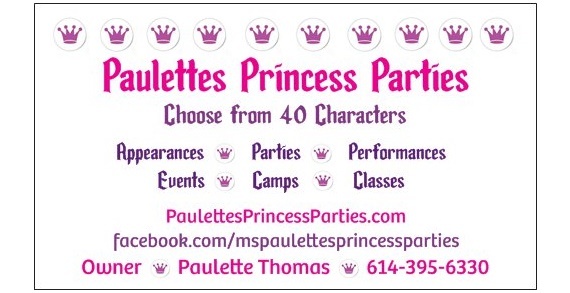 Paulette’s Princess Parties loves to come to events and even can do 10- to 30-minute performances!!! Call for special pricing. Paulette’s Princess Parties wants to be a part of your world!